Findings: Round region of decreased signal with mass effect (a) at the cervicomedullary junction. 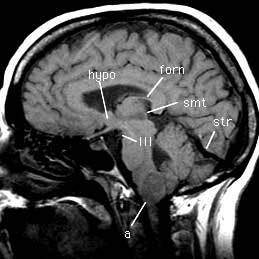 Hypothalamus (hypo). Crus of the fornix (forn). Stria medullaris thalami (smt). Oculomotor nerve (III). Straight sinus (str). Pituitary gland (pit). Posterior pituitary (ppit). 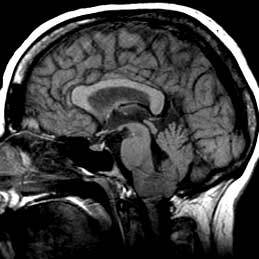 Pituitary infundibulum (inf). Optic chiasm (chi). Mamillary body (mam). Posterior perforated substance (pps). Internal cerebral vein (icv). Vein of Galen (vog). Quadrigeminal plate (quad).